Earlier, the spokesman for Patriarch of Moscow and All Russia Kirill said that the Russian Orthodox Church will issue a tough response to the decision of the Synod of the Constantinople Patriarchate to grant independence to the Ukrainian Church. The Holy Synod of the Russian Orthodox Church decided to suspend full communion with the Constantinople Patriarchate, Metropolitan Hilarion of Volokolamsk, chairman of the Department for External Church Relations of the Moscow Patriarchate said Monday. "At today's meeting of the Holy Synod, the decision was made to completely stop full communion with the Constantinople Patriarchate. It was a forced decision, but our Holy Synod was unable to make a different decision because the entire logic of the Constantinople Patriarchate's recent actions was leading to this," Metropolitan Hilarion told reporters. He said the Moscow Patriarchate hopes the Ecumenical Patriarchate of Constantinople will change its decision to start granting autocephaly to the non-canonical Ukrainian Orthodox Church. Metropolitan Hilarion of Volokolamsk went on to note that the Russian Orthodox Church expressed hope that Ukrainian President Petro Poroshenko would keep his promise not to persecute believers of the canonical Ukrainian Orthodox Church. "We hope there will be no clashes. We heard assurances from Ukrainian President Poroshenko," he said. 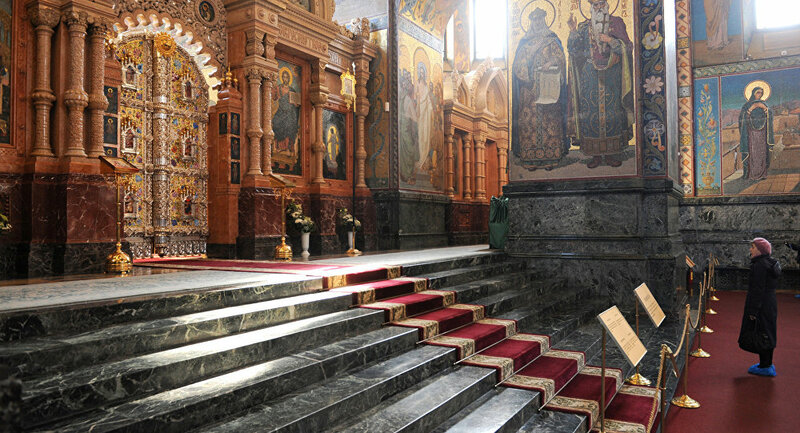 In addition, the chairman stressed that parishioners of the Russian Orthodox Church (ROC) will not be allowed to take communion in churches of the Constantinople Patriarchate when he was commenting further on the ROC Synod's decision to suspend full communion with the Constantinople Patriarchate. "In practical terms, this decision means that we will not be able to perform joint divine services with the Patriarchate of Constantinople, our bishops and priests will not be able to participate in celebrating liturgy jointly with the hierarchs and priests of the Constantinople Patriarchate, and lay people will not be able to take communion in churches of the Patriarchate of Constantinople," he said. The move comes following the announcement of the Constantinople Patriarchate on Thursday that it would proceed to the granting independence to the Orthodox Church in Ukraine, which is currently split into three major churches — the Ukrainian Orthodox Church (UOC) of Moscow Patriarchate, the non-canonical Ukrainian Orthodox Church of Kiev Patriarchate (UOC-KP), which was created after the collapse of the Soviet Union, and the so-called Ukrainian Autocephalous Orthodox Church. In addition, Synod announced earlier that it lifted the anathema from the heads of the two non-canonical churches that had been excommunicated by the Russian Orthodox Church for their schism. The Constantinople Patriarchate also revoked its decision to grant Moscow Patriarchate the right to ordain the Metropolitan of Kiev, which dates back to 1686. The synod's decision has been welcomed by Ukrainian President Petro Poroshenko, who looks to establish a single independent church in the country.